First you need to build your door, make sure you name all the parts that needs to move the EXACT same way. 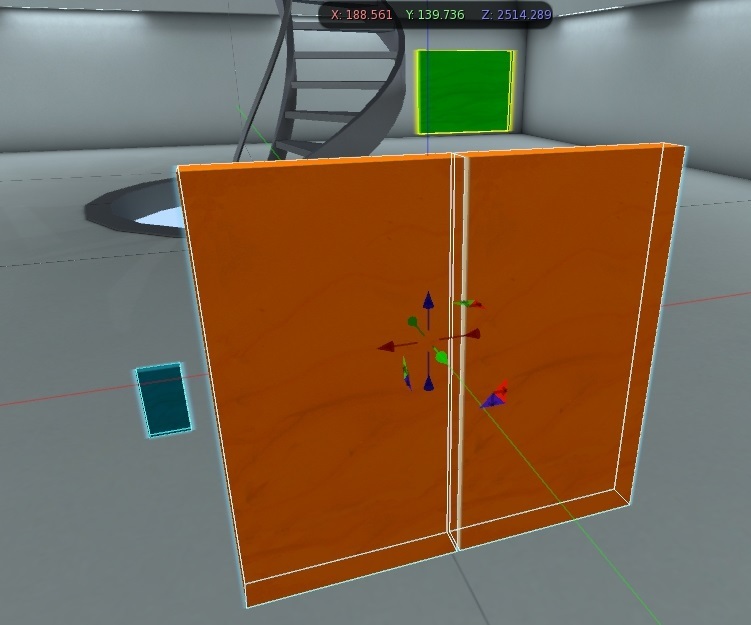 Then create a prim and link it last with your door parts to make it your "Root" prim. Linked prims appears blue when selected and root prim yellow. Like shown below. Once done with creating your object, its now time to put your scripts in but first you need to configure your config notecard. you will see all the parameters that can be configured for the door. 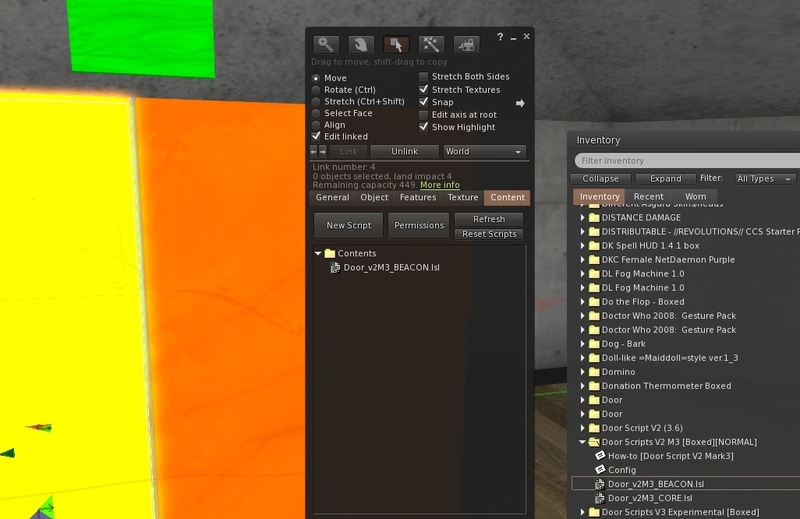 These two defines the name of the object parts the script will be looking for as moving parts and as triggers. Make sure you write here the same name you wrote for your objects earlier. Once you've done and saved your changes, you can put your "Door CORE" script next to the notecard. Root content after putting the core script and after notecard load. The script will then start loading the notecard and looking for the prims. Then because its your first 'run' the script will go into Setup mode. 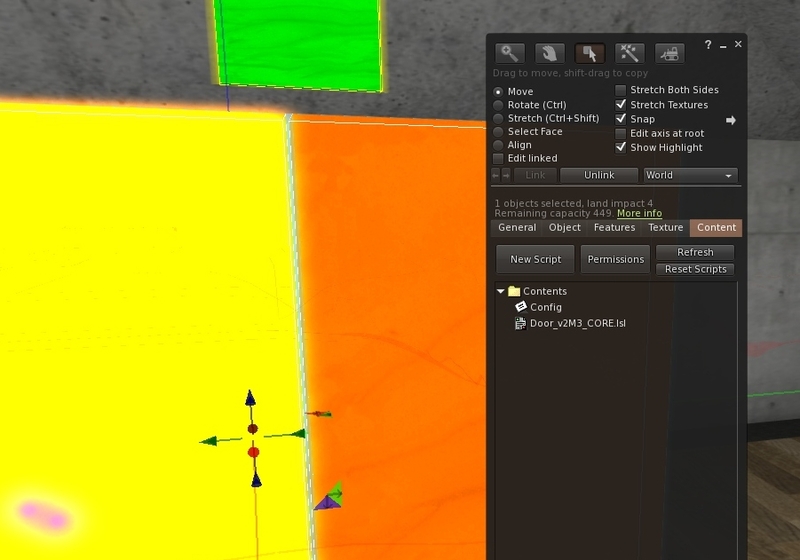 For this part you need to edit your object and enable "Edit linked parts" select the glowing object and put in it the beacon script. Once done, the main script will ask you to put that part at the position, rotation and size as it was in the CLOSED state of the door, when done putting it in place, click the part. The script will now ask for the same but as the OPEN state of your part, once again, when you finished moving it click it. You'll be done with that part. The main script will ask to do the same steps for each and every moving parts he has found. In the end, when all pieces has been configured the main script will reset and remove all beacon scripts. Here is the detail and explained lines of the Config notecard for advanced configuration. ActivationKey: < This line is only for BUILDER edition, to activate the script with your activation key. AutoCloseTimer:0 < Time in second before closing automaticly the door, 0 to disable it. Person List: < You can write here a list of avatar name seperated by commas to only allow them to use the door. Keycard Unlock:No < Allows a keycard user to unlock a door in case of a Code9 or Quarantine lock down. ExtraChannel:0 < Set this to a diffenrent number to use an external trigger (button) to control the door. Script API below. Make sure you dont edit the settings name and write your parameters directly against the ':' to avoid any bug. 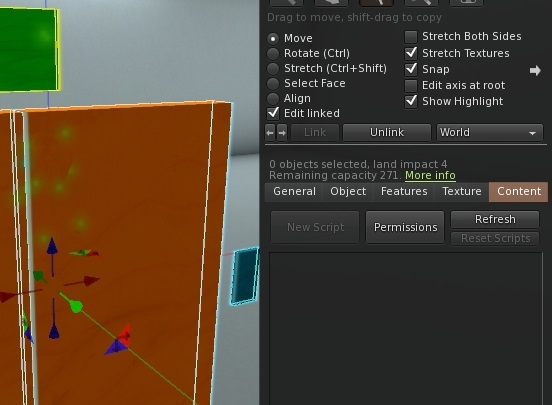 This simple API will allow script creator to add special effects when the door is working. If you don't know what an API is or basic LSL coding, please don't mind this section. As you can see you have multiple messages to use to know the current state of the CORE script. If needed we will update the system to add more outgoing messages. In case you write something in your notecard line ExtraChannel: you will be able to create a button not linked from your door. To activate the door you just need to send the user key. The script will then respond on the same channel in a shout, "Opened" or "Closed" to let you know its status.